Since launching in 2013, more than 9,000 people have taken part in ReelLIFE SCIENCE, making hundreds of STEM videos in 26 counties around Ireland. These videos have received more than 130,000 views worldwide and have been featured on RTÉ’s News2Day and TG4’s Cúla4 TV programmes. Below you can see a summary of each year’s competition, with the winning videos, prizegivings and special guest judges. You can see a larger selection of videos in our Video Library organised under various themes, such as ‘Energy, Forces, Physics and Space‘ and ‘Our Healthy Bodies‘. A full list of 2017 prizewinners can be found here. 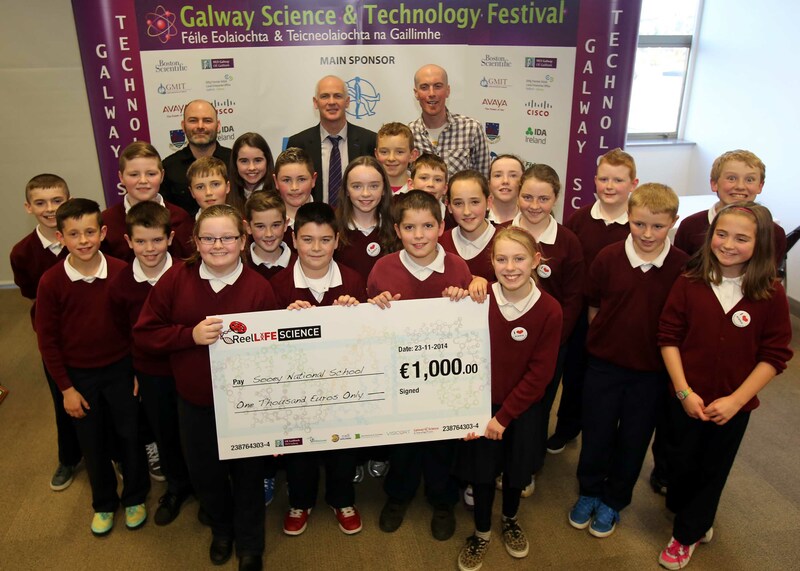 The judges selected ‘Life in Space – An Saol sa Spás!’, produced by 4th class students of Gaelscoil Riabhach (Loughrea, Co. Galway) under the direction of teacher Brian Ó Meacháin, as the best primary school video, and deserving winners of the €1000 first prize. Described by Maria Louise Fufezan as “a really inspiring video that successfully communicated the wonders of life in space” the students interviewed NASA astronaut Colonel Ron Garan about his experiences aboard the International Space Station. Primary School Winners 2016 Gaelscoil Riabhach, with (back row, l-r) NUI Galway Dean of Science Prof. Donal Leech, GMIT Head of Science Dr. Des Foley, NUI Galway President Dr. James Browne, Medtronic Director of Research & Development Ronan Rogers, Muinteori Brian O Meachain, ReelLIFE SCIENCE Director Dr. Enda O’Connell. Photo credit Andrew Downes, Xposure. The secondary school competition saw Patrician High School (Carrickmacross, Co. Monaghan) Transition Year students John Ubaldo and Colm Lonergan, with guidance from their teacher Maeve Reynolds, claim the CÚRAM-sponsored €1000 first prize, with a video entitled ‘How The Sun Works’. “A film with engaging animation and good scientific content“, according to Prof. Eleanor Maguire, this animated video communicates complex concepts with an easy-to-understand, visually striking style. 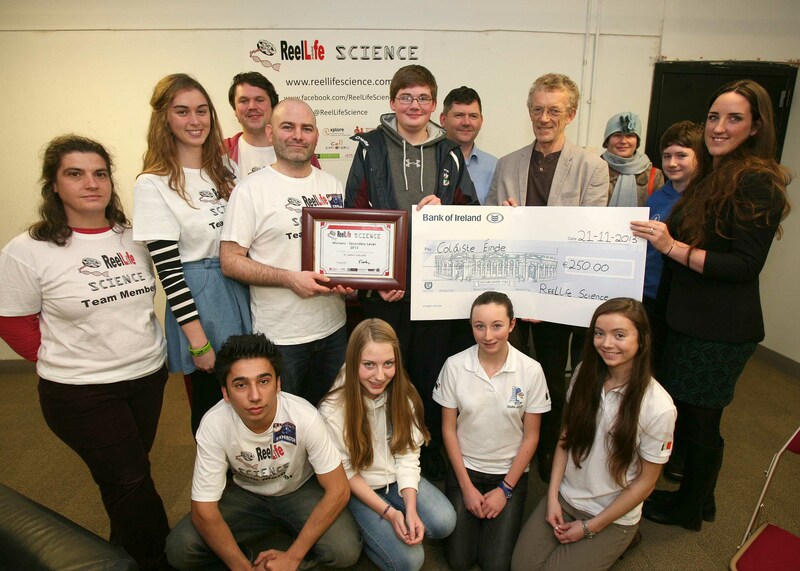 Secondary School Winners 2016 Patrician High School with (l-r) GMIT Head of Science Dr. Des Foley, Galway Science & Technolgy Forum Marketing & Administration Manager Anne Casserly, NUI Galway President Dr. James Browne, John Ubaldo & Colm Lonergan (both Patrician High School), Medtronic Director of Research & Development Ronan Rogers, NUI Galway Dean of Science Prof. Donal Leech, ReelLIFE SCIENCE Director Dr. Enda O’Connell. Photo credit Andrew Downes, Xposure. A full list of 2016 prizewinners can be found here. A full list of 2015 prizewinners can be found here. 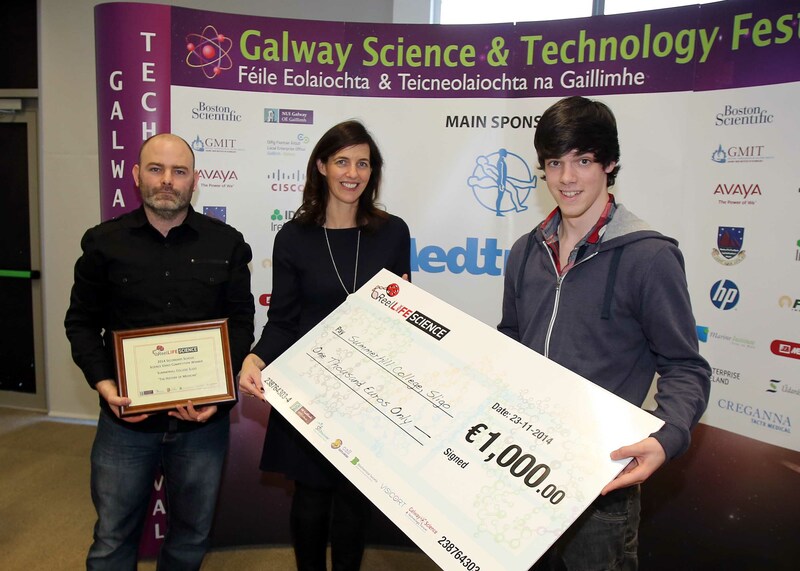 ‘The History of Medicine’ was made by Leaving Certificate student Julien Torrades of Summerhill College, Sligo, under the supervision of his Art teacher Jonathan Cassidy, winning the Primary School first prize of €1000.. The video was described by Prof. Curry as “a good use of stop-motion…with a nice sense of humour…covering an impressive amount of ground in a short space of time”. In first place at Secondary school level, under the “Astrobiology” category, we have a stunning video called “Life in Space” created by the multi-talented St. Enda’s College Transition Year student Michael McAndrew, under the direction of Mr. Fahey and Mr. Conroy. This remarkable film combines a fantastic concept and animation style with an intelligent script, wonderful delivery and original score. The film describes the fascinating field of Astrobiology, encompassing the origin and future of life on earth and the search for extraterrestrial life in other “Goldilocks Zones”. The simple yet effective cartoon style could conceivably be used to explain a range of different scientific topics, and the ReelLife Science team can’t wait to see more of Michael’s excellent work. In Michael’s own words “it is very exciting what the future might bring us“. In first place at Primary school level, under the “Habitats” category, we have a video as Gaeilge about Seed Dispersal called “Scaipeadh siolta i Rosmuc”. This memorable video was made by the 5th and 6th class students in Scoil Mhuire Rosmuc, under the direction of their teacher Ms. Ni Chonaola. The wonderfully produced video comes with an extremely impressive script, to which Ms. Ni Chonaola was kind enough to provide an English translation for non-Irish speakers. The students took a very specific topic in Seed Dispersal and Germination, and produced three very amusing and informative sketches demonstrating different methods of dispersal. Furthermore, they performed some experiments of their own on the various seeds they found, identifying the different traits associated with them, based on their method of dispersal.